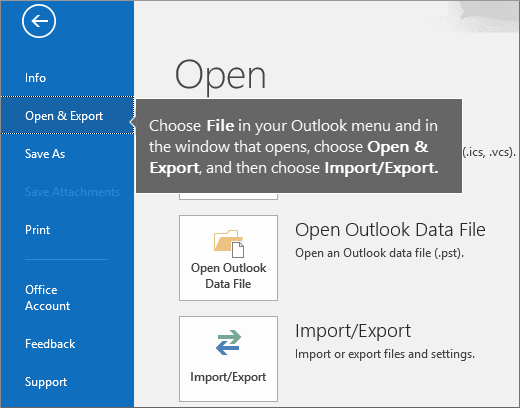 Import a copy of all of your old email into your Office 365 account. This way, you can have all of your email—past and present—in one account. Choose this option you have the Outlook app (2013 or 2016) installed on your computer, and you plan to retire your Gmail account. Instructions are provided below. Connect your old email account to Outlook. You will be able to see and access your old email, but it will be stored in your Gmail account, not in your Office 365 account. Choose this option if you plan to keep your Gmail account active, or you don't have the Outlook app installed on your computer. 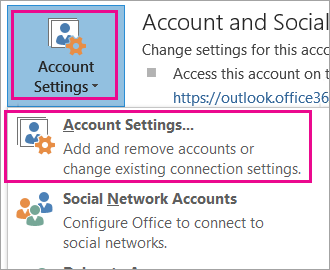 For the steps, see Connect email accounts in Outlook on the web (Office 365). Have your Office 365 user id and password handy. Install the Outlook app. It comes with most Office 365 plans. If you don't have the Outlook app, see how to get the Outlook app. Tip: Don't have Office 365? And you want to keep Gmail as your service? 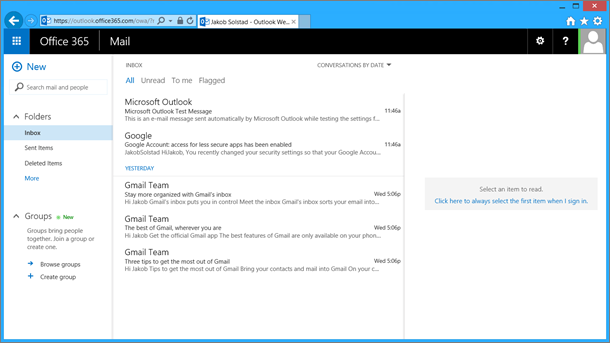 You can still use Outlook to read, write, and manage your email. 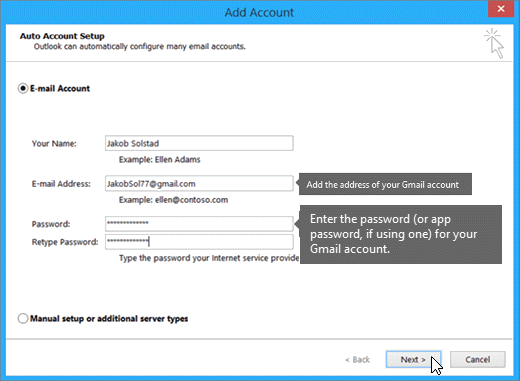 Just perform Step 1: Prepare Gmail for connecting to Outlook and then Step 2: Add your Gmail account to Outlook. When you're finished with this step, you'll see your existing Gmail messages in Outlook. 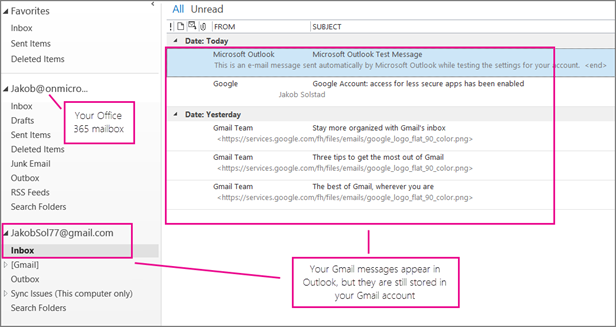 You can use Outlook to receive, read, and send new messages from your Gmail account. You can also continue to use your Gmail account as before through the Gmail web site. 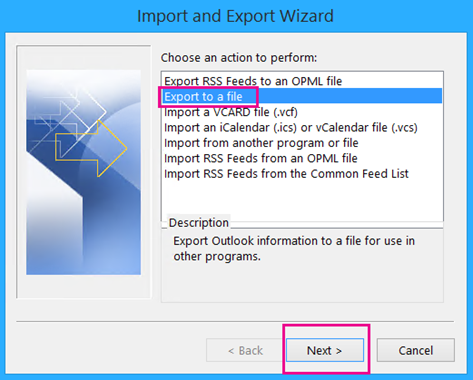 You can only use a version of Outlook that has File in the left corner - it means your version has an Import/Export wizard. If your Outlook ribbon looks something like the one below, then you're not using an Outlook app that's installed on your computer. See How to get the Outlook app. 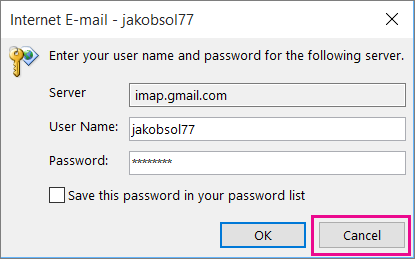 If the configuration process doesn't finish and you instead get prompts to enter your user name and password for the imap.gmail.com server, choose Cancel and re-enter your app password in case the first one had a typo. If you continue having problems, see Fixing problems with adding Gmail to Outlook. 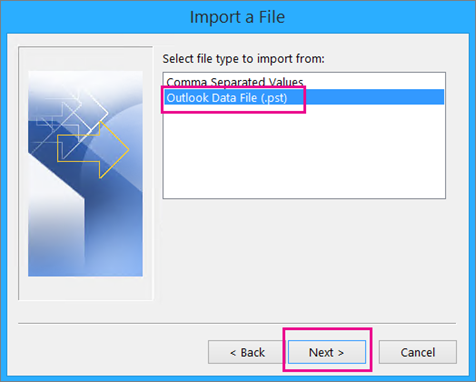 Choose Browse to select where to save the Outlook Data File (.pst) and to enter a file name. By default, the name is "backup," so choose another name that's easy to remember, such as gmail. If you are exporting to an existing Outlook Data File (.pst), under Options, specify what to do when exporting items that already exist in the file. Choose Finish to continue. In the Add an optional password dialog box, add a password if you want. 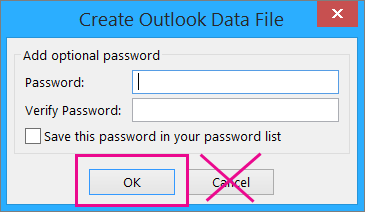 Choose OK to save the data file even if you leave the password boxes empty. 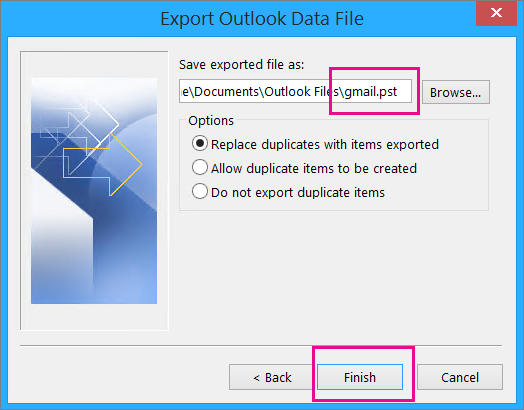 Without further notice, Outlook begins exporting the data immediately. It doesn't give you a message when it's done, either. Go to the location where you saved the .pst file to confirm it's there. When you're finished with this step, the email in the .pst file will be available in your Office 365 mailbox. 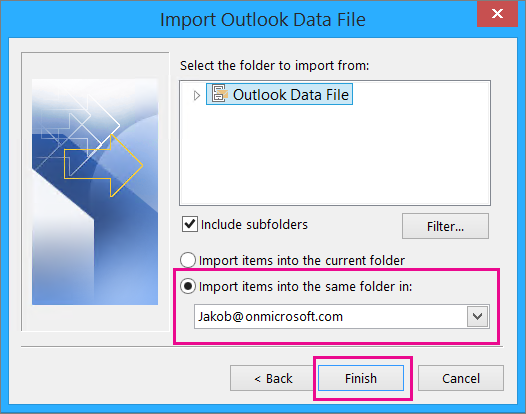 Choose to import the email into your Office 365 mailbox (in the example, the Office 365 mailbox is named Jakob@onmicrosoft.com). Choose Finish. Outlook starts copying the information from the .pst file to your Office 365 mailbox. If you have lots of data, this may take hours. If you shut down Outlook or disconnect from the Internet before the import completes, it will continue the next time it's reconnected. When Outlook is finished, you'll see the snapshot of your Gmail, now stored in your Office 365 mailbox. Congratulations! Your old Gmail messages are now in your Office 365 mailbox! When you're finished with this step, your Gmail account will still exist, but you won't see it in Outlook. 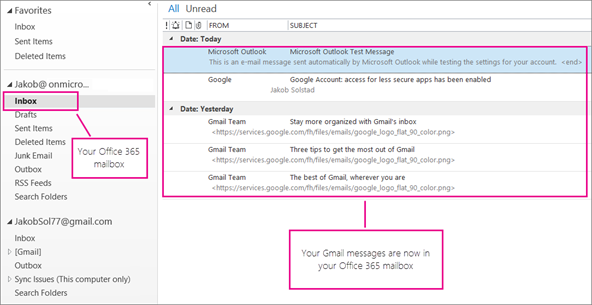 If you receive any more emails at that Gmail account, you'll need to repeat the steps in this article if you want them in your Office 365 mailbox. Or, you're using a computer that you haven't used before to sign into your Gmail account. Or, you haven't signed in to your Gmail account for a while. Sign in to your Gmail account using the same computer you're going to use for the Add account process. Make sure you've done the steps to prepare your Gmail account. Problem 2: If, instead of seeing your Gmail messages in Outlook, you get an error message along the lines of "Your IMAP server wants to alert you to the following......" go to your Gmail account and check that Allow less secure settings has been set to ON, and then do the steps again to add your Gmail account to Outlook. Problem 3: You get the error message "Could not complete the operation because the service provider does not support it." 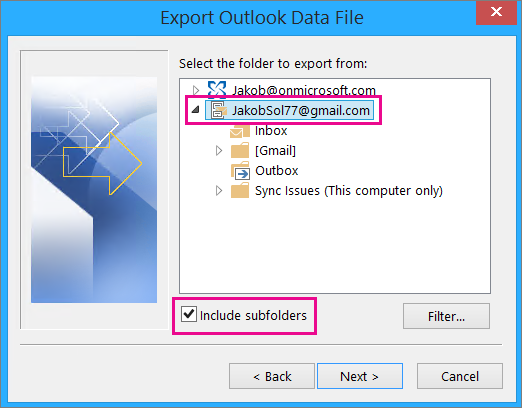 Are you trying to import your Gmail messages into an Outlook.com or Hotmail.com account? This error is the result of trying to import into an Exchange ActiveSync (EAS) account. 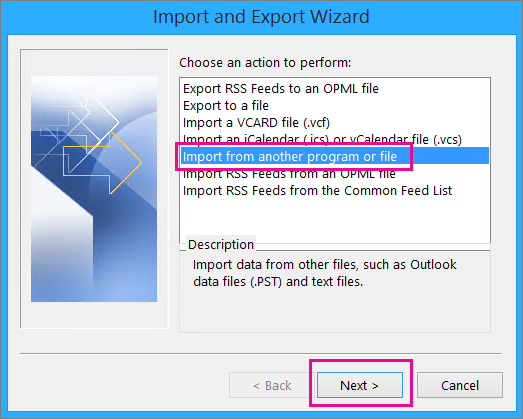 The EAS service provider (Outlook.com / Hotmail) does not support importing (or moving), only copying into the folder. For instructions, see Add all your email accounts to Outlook.com.